You may have heard that lists are a great way to generate traffic to your blog. Well it’s true. People love lists because it gives them easily digestible information in a step by step format that encourages them to take action. One of the most popular list post type is the top X ways to do Y. Giving your visitors a single awesome tip on how to save money will likely turn them into subscribers. Giving them ten top tips on how to save money will make them evangelists. But, how do you go about writing these how to lists, you may ask? Perhaps you’re doubting your ability because you’re not an expert in a massively useful topic. Well you don’t need to be! What you need is the ability to collect information and organize it in a way that is helpful and actionable. Though, as you’ll see below in our top ten ways to write a top ten ways post list, having expertise or creativity can help too. It’s unlikely you’re treading completely new ground with your top ten ways to do X post, so fire up Google and take a look around. Do not copy someone else’s post, but use it as a base to make sure you cover the basics while also injecting new methods into your list. Or, you could avoid Google completely and go entirely off your memory. It’s dangerous as you could accidentally mimic someone else’s popular post, but you might also find inspiration to blog about a few methods no one thought to mention before that came to you naturally. Since Twitter is real-time, searching it for your list topic could generate some fresh new ideas that were literally just thought of. If you find someone tweeting about a relevant step for your list, be sure to give kudos to the twit by linking to their message. Got a big list of followers on Twitter? Ask your tweeps for ideas! Again, do be sure to give credit where it’s due, but your tweeple should be a great pool of new ideas, especially if many of them are in the same field as you. Look at other top ten lists and see if any of them are missing a step. Perhaps someone wrote a top ten ways to secure WordPress post but failed to mention a plugin or how to back up your database. Find the missing step and inform your readers about it. While doing research, perhaps you found a few great posts already listing out the steps of your topic. But could they be improved upon? Could you drop 5 steps and streamline them so they’re easier to implement? If you can find a way to save your readers time, they will appreciate it. Perhaps the topic you’re covering is very broad and tough to thoroughly go over in a single list of ten. That’s OK! Creating a link list that summarizes each step and points the reader to more expansive resources for each step is a great way to create a one stop article for your readers to get all ten pieces of information in one article. Then, if need be they can follow up with each link on their own. If you know someone who has expertise in a field, utilize that connection! If your site is popular enough, you should be able to easily find guest posters willing to write a top ten list revolving around their field of expertise. They get a traffic boost, you get a free list and your readers get a great resource and get exposed to an expert. It’s a win-win-win. Don’t know anyone with expertise in the field you want to cover? That’s OK. Hit up Elance, Craigslist, Twitter and other freelancing job boards. For $40-$80 you should be able to find a great writer who can create a compelling list that’s sure to draw eyeballs. Sharing with your readers how you learned something is a great way to build a list. Read a book, research online, or just hack away until you learn something and then share with your readers how you learned it. First off, the fact that you used this method to learn something knew shows proof of the method’s effectiveness. Second, if they’re reading your blog then they’re likely already on a similar wavelength with you and would love to see how you learned more about that topic. Some of your readers may even be more experienced in that field and offer more helpful tips. It seems obvious posts are overtaking the blogosphere. Go in the other direction and approach a modern dilemma from a theoretical perspective. Maybe you’ll be wrong, maybe you’ll be right but if you write it right it’s sure to generate a discussion around the idea. For instance, write a top ten ways to create world peace post. Or go super geeky and write about the top ten ways to break the speed limit barrier and travel across the universe. Do let your readers know you’re just brainstorming or hypothesizing about possible solutions, not claiming any expertise or factual solutions. Sometimes it’s OK to pretend and aim for the impossible. Going through the above list, you should be able to knock out top ten ways list posts in no time that are useful and beneficial to both you and your readers. Have an additional tip for how to write great how-to lists? Share them below in the comments so we can all learn how to improve! 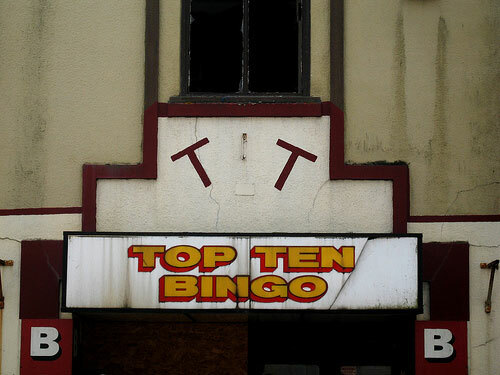 Top Ten Bingo photo by pigpogm. This entry was posted on Saturday, October 10th, 2009 at 3:38 pm	and is filed under Blogging Tips. You can follow any responses to this entry through the RSS 2.0 feed. Both comments and pings are currently closed. Lists do really have a tendency to get noticed. Collect 101 methods to save money and I can guarantee people will bookmark it, Stumble it and also link back to you without reading half of your tips. Very true Stefan, I know I’m even guilty of doing so a few times, especially when you get through half the tips and they’ve all been gold so far, it’s a bit too easy to assume they all are and share away. I have a mini-library of bookmarks tagged toread in my delicious account that only grows more and more each day. Thanks for sharing this information, great post! !